Deputy Governor David Archer, Jr (left) and Governor Augustus Jaspert. Deputy Governor David Archer, Jr has been appointed to act as governor. His appointment took effect today and will run until Monday, April 2. A government media release said Archer is acting in the position in the absence of Governor Augustus Jaspert who is on annual leave and will return on April 3. “Mr Archer took the Affirmations of Allegiance and Due Execution of Office to act in the post of Governor administered by Her Ladyship the Honourable Justice Ann-Marie Smith,” the release said. 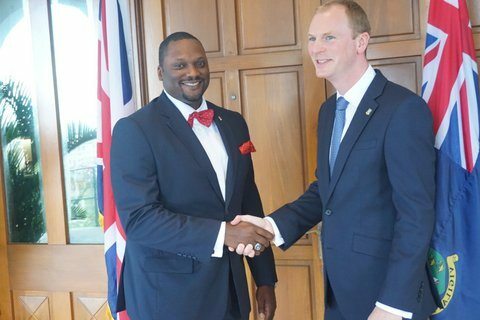 Archer was only sworn in as Deputy Governor of the British Virgin Islands this month. Who is the Acting DG? Soooo if the governor has gone on leave,what about the recovery agency bill . one of these, some with brilliant political minds, would be elected “governor” if we so had that human inalienable right and privilege? Will w, as a people, ever wake up to and change our own destiny? The governor needs to be someone who does not have cousins seeking govt contracts. You start off wrong by replacing Andrew. As for the rest of the slate only Mitch and Marlon may keep their seats and the others dead before arrival not even dead on arrival. Wonder if there is a typo? He deserve more vacation than 3 days!